"Porquoi Je Danse ?" Video crée pour le webdocumentaire intitulé "Pourquoi je danse ?" La Maison de la Danse | Numeridanse.tv.. Video Paulo Henrique & Play Bleu 2015 Support ARTE TOTAL, Braga (PT). Photograpic work collaborations with Eva Mueller, Iris Brosch, Robert Flynt, Play Bleu. Shared concepts reagarding the body, space, performance and the camera. "La performance déformante de Paulo Henrique"
"A performance you should see if you can"
● Braga International Video Dance Festival, 4th Edition (PT).PRODUCTION and hosted by Arte Total, DIRECTED and CURATED by Cristina Mendanha and Paulo Henrique, Braga (PT). ● Collaboration "The Fop" : Love & Lust In Victorian Queer New York , Conceived and Written by Jack Shamblin Co-Produced by Anna Augustsson, Co-Directed & staging by Paulo Henrique, Dramaturgy by Joe E. Jefferys. DIXON Place / Feb 2018 / New York (USA). ● Braga International Video Dance Festival, 3rd Edition.PRODUCTION Arte Total, EXECUTIVE DIRECTOR /ARTISTIC DIRECTOR : Cristina Mendanha, FESTIVAL ART MANAGER & Jury : Paulo Henrique, Braga (PT). ● Intervention / Performance "Effraction", vernissage de la sculpture Parure de Axel Rogier-Waeselynck, / #CRR93 / Mai 2018. in collaboration with Cie.Abel (FR). ● Festival International des 4 Chemins | Multidisciplinary festival, multi-cultural and multilocalized in the district of 4 Chemins, Au Clos Sauvage, in collaboration with Cie.Abel (FR). ● Braga International Video Dance Festival, 2nd Edition (PT).PRODUCTION Arte Total, EXECUTIVE DIRECTOR /ARTISTIC DIRECTOR : Cristina Mendanha, FESTIVAL MANAGER / TECHNICAL DIRECTOR : Play Bleu, FESTIVAL ART MANAGER : Paulo Henrique. ● the PORTRAITS - case#1 PARIS & PAULO, the PORTRAITS - short video documentary directed by Alisa Kunitsyna. Stories about creative people and the cities where they live. 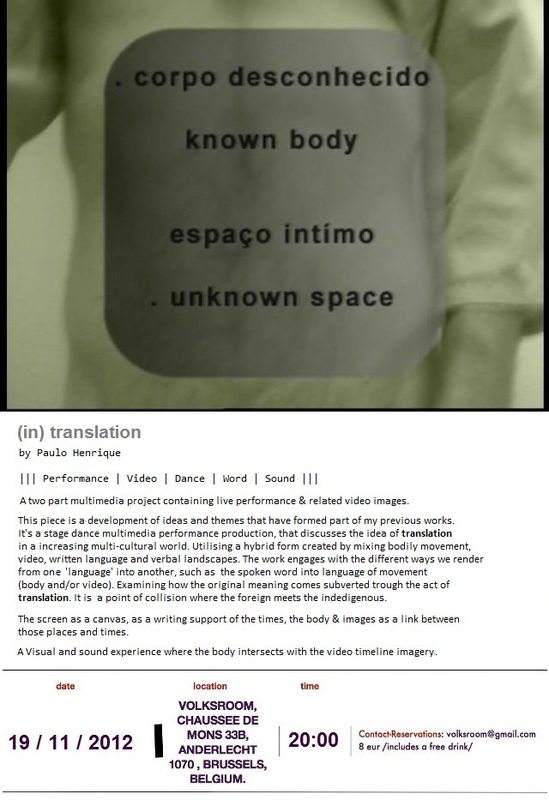 This story is about Paulo HENRIQUE (choreographer/working with video installation) and Paris. Dance extracts from videos by PLAY BLEU and by José BUDHA. Artistic collaboration with digital artist João Martinho Moura, "Guelra" residency ARTE TOTAL / GNRation (PT), Camões-Instituto da cooperação e da lingua | la Maison du Portugal-André de Gouveia (FR). ● Participation Projet lanternes | Little Villette | Paris. "Une danse du crépuscule". Théâtre Les Poussières | Cie Abel, with Evelyne Le Pollotec and Paulo Henrique. ● Collaboration with the photographer Christophe Apatie. ● Video Dance Festival - Body in Focus, 1st International Screening of Video Dance. "CORPO em FOCUS / BODY in FOCUS". Hosted by NORTE Festival de Dança 2015. FESTIVAL MANAGER / TECHNICAL DIRECTOR Play Bleu, ARTISTIC DIRECTOR / FESTIVAL ART MANAGER Paulo Henrique. ● "Thinking / Drawing" Curious Gallery Winter 2015 show. The use of drawing as an aid to their creative thinking process - until 7 Feb 2015, Curious Projects, Eastbourne (UK). ● "Thinking / Drawing" Curious Gallery Winter 2014-15 show. The use of drawing as an aid to their creative thinking process - Sat 6 Dec - Fri 7 Feb 2015, Curious Projects, Eastbourne (UK). ● "L'UOMO" Collaboration on the performance project by Iris Brosch, produced in Venice for Open17 / Arte Communications in 2014. A video directed by Iris Brosch (FR / IT). ● Festival MarginalArtes Dance Video Installation | Play Bleu [Filipe Lopes], Arte Total. 18 until 20 July | Casa das Artes, Arcos de Valdevez (PT). 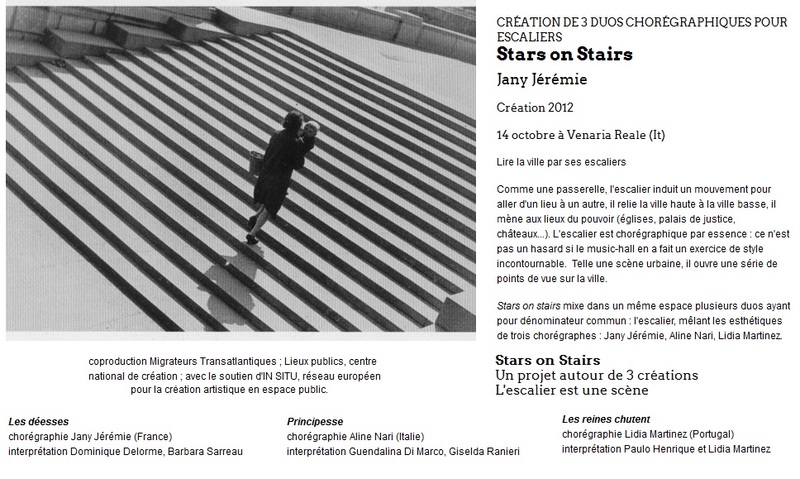 ● Project presentation, part of Chantiers D'Europe / Theatre de la Ville - Paris 17.06.2014 | 18h30 | Fondation Calouste Gulbenkian Paris. In partnership with Camões-Instituto da cooperação e da lingua | la Maison du Portugal-André de Gouveia (FR). Participation of Lidia Martinez | presentation of new works and work in progress (video) Luciana Fina, PlayBleu (PT) and (photography) Eva Mueller (USA). ● Artistic Residence - Guelra - Choreographic Transcreation Laboratory. The project aims to address the connection and artistic interaction in the trans-disciplinary nature of dancing and writing, exploring the link between four main aspects: space, memory, body and writing. Arte Total, 2nd - 8th March, 2014, Braga (PT). 9th -13th January 2014, New York (USA). ●"Vecteurs du Corps", Video Installation | Collaboration José Budha | Maison du Portugal-André De Gouveia, Paris | 19th-29th September - Part of the Week of Foreigners Cultures (Semaine des cultures étrangères), Paris (FR). Paulo Henrique has been creating multi-disciplinary works, dealing with body performance, new technologies, sound & image since 1993. He has created a number of dance performances and installation works, integrating media such as video, sound, text, voice, and visual arts. He has been awarded grants, awards and fellowships:Gulbenkian Foundation / Luso-American Foundation / Centro Nacional Cultura for artistic residences and research at the Lee Strasberg Theatre Institute, The Trisha Brown Dance Company and Film&Video Arts (New York, 1997-2001). In addition, he took part in several artistic residencies such as "Korper-technik|Body-Technology". (Germany) and "European Choreographic Forum"/Shinkansen (UK). He has taught at Forum Dança, C.E.M., and Arte Total, and was a guest lecturer at Brighton University (postgraduate diploma in digital media arts). He was part of the juri panel in Portugal for the contest "Jovens Criadores" (Youth creators) by Clube Português Artes e Ideias and creator of the group "CoNbined-Forms" (2000) an internet sharing platform, exchanging & facilitating inter-disciplinary communication/ information, vital for any artisic community. His performance work has been presented by: Festival Made In Corpus (France), Danças na Cidade (Portugal), AMORPH Festival (Finland), Anymous Festival (Czech Republic), Festival SpringDance (Netherlands) and many others. In New York at Dance Theater Workshop and Location One Gallery. His work was commissioned by the EXPO98 World Exhibition (PT) and by DTW's Bessie Schonberg/First Light Commissioning Program funded by Jerome Foundation (USA). Collaborated with the photographers Robert Flynt, Eva Mueller and Iris Brosch. His work is part of the Digital Performance Archive [DPA] and was recently mentioned in the book "Digital Performance": A History of New Media in Theater, Dance, Performance Art, and Installation by Steve Dixon/ Mit Press. 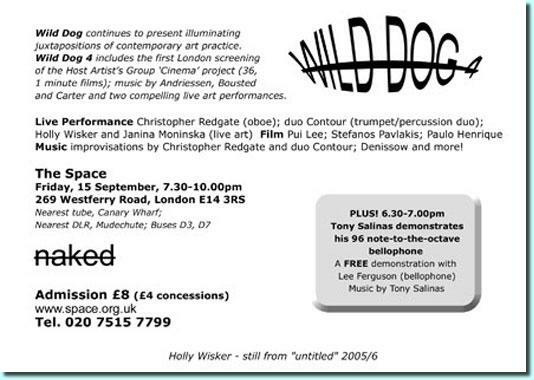 2007 and "TeDance, Perspectives on Technologically Expanded Dance by Daniel Tercio/ FMH 2009. 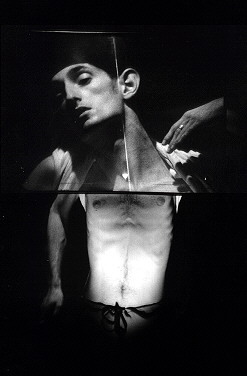 ●"Contract With The Skin"(Video) - Juri prize "Performance Inside the Screen"
●Live Act & Video "Contract With The Skin", Festival Anymous, May 20th, Pilsen, Czech Republic. "Man In The Park" | "Hacker" | "(in) translation" | "Transformation or metamorphosis" in 2012.
and many other festivals, theatres and venues in Argentina, Austria, Brazil, Britain, Croatia, Germany, Italy, Japan, Marroco, Portugal, Palestina, Romania, Spain and U.S.America. ●"VideoRoom",part of "Suspended Lines (move//still)"
"://selfportrait - a show for Bethlehem - a show for peace"
All dates / places for "://selfportrait"